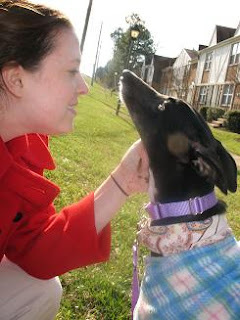 Usually, I blog on myspace.com, but I realized that perhaps my "normal" friends might not be as interested in reading ad nauseum about our great greyhound adventures as are our other equally obsessive greyhound friends. So, I have decided to join the ranks of these bloggers for the sole purpose of detailing how much we love our little (ha!) greyhound Ana, whom we have now had for about 4 months and can't imagine what it would be like today if we didn't have her. I look forward to posting about all of our various greyhound activities and the wonder that is Ana.